Kumquats are a citrus fruit that is in season in early winter in most places. They look like miniature, oblong oranges, and every part of them is edible except for the seeds. In fact, the peels are the most flavorful and aromatic part of kumquats. 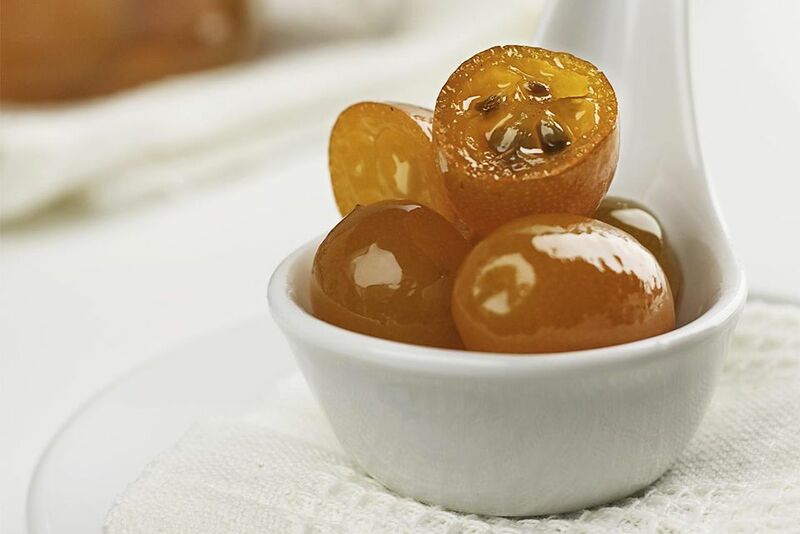 Serve preserved kumquats alongside coffee or desserts, or in the bottom of a glass of champagne. They are also amazing dipped in melted chocolate. Wash the kumquat fruits. Use a paring knife to slice a thin sliver off of the stem end of each fruit (that's the end with the whitish round dent). Pierce each kumquat twice with a toothpick. Put the prepared kumquats into a pot and add just enough water to cover them. Bring the kumquats and water to a boil over high heat. Boil for 2 minutes. Drain in a colander. Return the kumquats to the pot and again cover them with water. Once again place the pot over high heat and boil the fruit for 2 minutes before draining. Repeat the whole procedure for a total of three 2-minute boils. After the kumquats have drained in the colander for the third time, return them to the pot. Add the sugar, water, cinnamon stick, cardamom pods, and clove. Cook over medium heat, stirring ​constantly, until the sugar has completely dissolved. Raise the heat to high and bring the ingredients to a full boil. Reduce the heat so that the mixture is gently simmering and cook for 30 minutes more. There should be bubbles steadily rising to the surface of the liquid, but the fruits should not be vigorously bouncing into each other. Remove the pot from the heat. Spoon the kumquats into clean canning jars (it is not necessary to sterilize the jars for this recipe because they will be processed for a full 10 minutes). Leave 1 inch of head space. Once you've transferred all of the fruit to the jars, spoon the syrup from the pot over the fruit. The kumquats should be completely covered by the syrup, but there should still be at least half an inch of head space between the surface of the food and the rims of the jars. Wipe the rims of the jars clean with a moist cloth or paper towel. Screw on the canning lids and process in a boiling water bath for 10 minutes.